When my dog, Harper, was younger, she barked indiscriminately at every animal she found. Then she figured out that if it was a snake, I would make her come away from it, and she changed her reactions. Now if she finds a turtle, she stands in one spot and barks like crazy; if she finds a skink, she noses silently through the brush trying to catch it; if she finds a frog, she leaps around behind it (and loses it when it changes direction); and if she finds a snake, she just stays in one place with her nose down, gently wagging her tail with delight, no doubt thinking that she will get to investigate more fully when I have walked on. But being that I have caught on to her system, I rush over to protect the snake and the dogs from each other. So that is usually how I notice snakes I would otherwise miss. Here is who has turned up so far this year. This first snake showed up in January. (We didn’t really have a snake-free season this year as the winter was very mild. The last snake of 2015 was a ribbon snake spotted on Dec. 12.) This one I found all by myself, after I stepped right over it down by the creek. It was very small, about 14 inches long (35 cm). I was surprised that none of the animals had noticed it, but then I realized it was very recently demised. Well, I didn’t want it to have died in vain, I thought it would be glad to contribute to science, so I took the opportunity to get really good pictures. There seemed to be some puncture wounds in different places. Our ducks were in the area and were stirred up — I don’t know if they killed it or what else might have done so. Young Diamond-backed Water Snake (Nerodia rhombifer rhombifer). Its belly had a distinctive pattern that helped me with the ID. Young Diamond-backed, close-up of face. 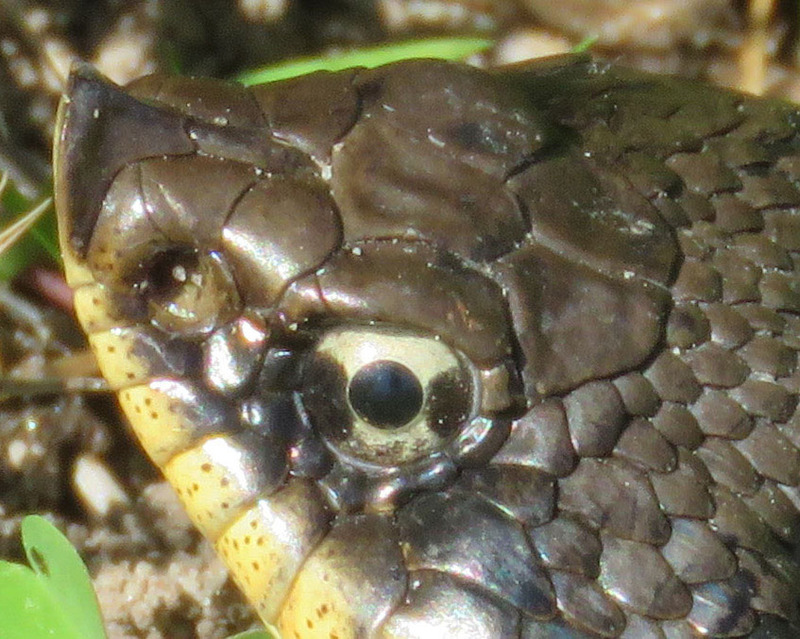 The dark vertical lines in the yellow lip area are a clue to me that it is in the water snake family. There is another snake that I see swimming in the pond quite often, that I have never been able to get a good picture of. Identifying this young one as a Diamond-backed Water Snake helped me figure out that that elusive snake is the same species. I had a mystery snake here last year, that I thought was a Yellow-bellied Water Snake; now I think it might have also been a Diamond-backed, just older and darker. 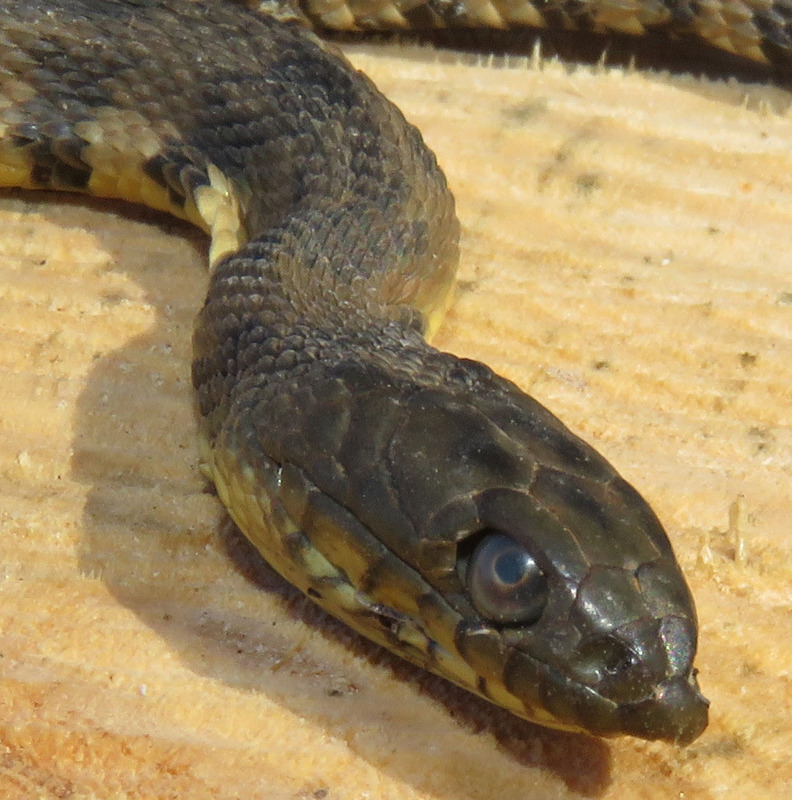 I identified another young snake as a Blotched Water Snake – do we have four different water snakes here? or just two and I am mis-identifying? More research is needed. 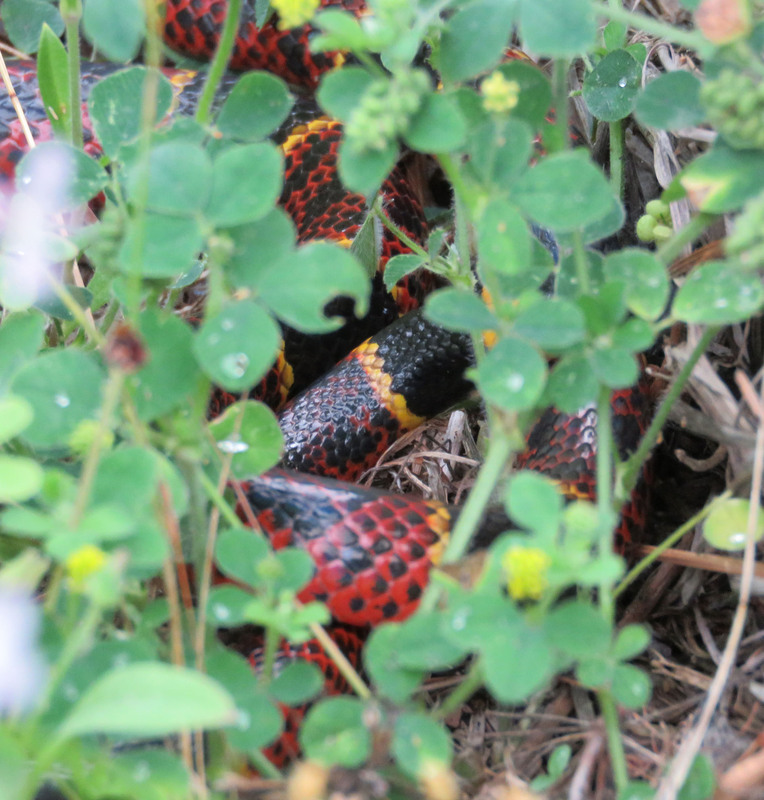 The second snake was much easier to identify — it was a Coral Snake! Back in April, it was just out on the driveway — the dogs saw it and chased it. We have a 6-month-old puppy now too (named Brady) and I didn’t know if he would mind me the way Harper does, but he stayed back long enough for me to get just a few shots of the snake in deep grass. I brought the dogs down to the kennel, and by the time I got back, the snake had gone on its way. Coral Snake, (Micrurus tener). The black blotches in the red show that this is a Texas Coral Snake. Then last week, Harper alerted on a snake. 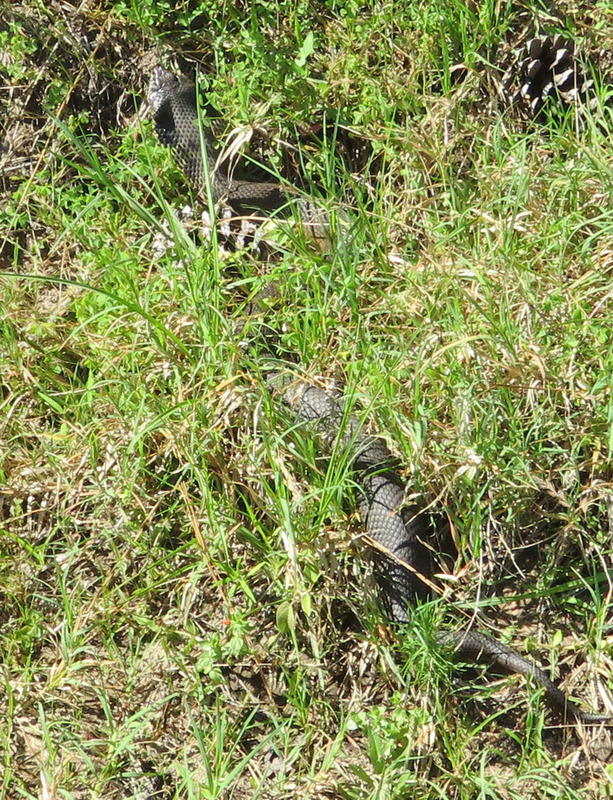 When I saw it, I couldn’t immediately tell what it was, and thought it might even be a cottonmouth. When I got a better look, the snake reassured me by flattening its head and hissing, proving that it was an Eastern Hog-nosed Snake. I got some good pictures, the poor snake was threatening us for all its worth, but the sheep just calmly grazed about a foot away from it, unworried. I see hognoses a lot, sometimes two at a time. I would love to know if they are different individuals, or the same ones just traveling around their territory. Eastern Hog-nosed Snake (Heterodon platyrhinos). You can see the sharp up-turned snout. 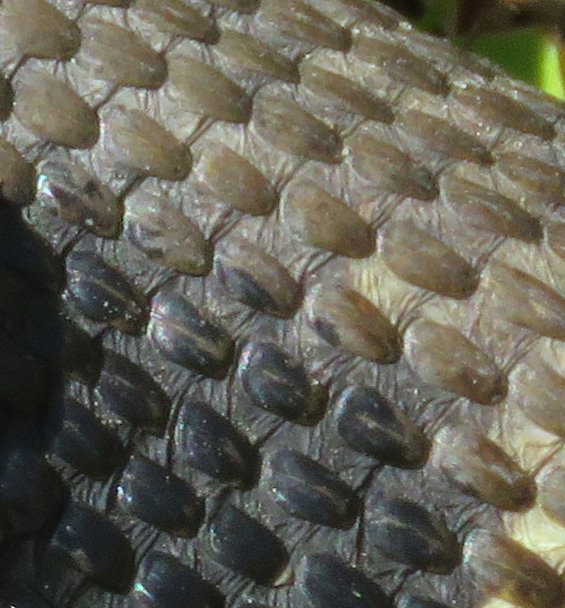 I like the pattern of the scales and puckered skin between them. Alan Tennant in Texas Snakes says that these snakes are predatory specialists — they can eat a diet of toads which other predators cannot handle because of the toads’ toxic skin secretions. “To offset the compound’s effect and maintain its proper heart rate, H. platyrhinos has developed huge adrenal glands… with a weight 10 times heavier, in proportion to their bodies, than the adrenals of other snakes. Okay, I don’t want to know who was the person who discovered that! I’m just glad the snakes here can roam at will and catch their own prey. fascinating! What a beautiful coral snake. Reading through this made me realize how haphazard and random my snake knowledge is – which is kind of surprising, given I spent an enormous amount of time wandering unsupervised through the Texas Hill Country wilds and Piney Woods as a kid – I have seen plenty of water moccasins but assumed they were all cottonmouths, and never could remember the rhyme (red-and-yellow… was that ‘dangerous fellow’ or ‘friendly fellow’?). I guess I was just trained to treat all snakes with great respect so the details didn’t matter so much! Water moccasins and cottonmouths are the same thing, but then there is this whole other family of water snakes that I certainly didn’t know about before I moved up here. 9 species in that family and 5-6 of them occur here. I learned “red touch yellow, kill a fellow,” (meaning it could kill me, not that I should kill it) and “red touch black, friend of Jack.” But you are right, if you just treat them with respect, you can enjoy them without worrying! Oooh, yuck! I pop in here after a long absence and find … snakes! I have no idea why I have such a deep aversion to them. I’m not afraid of spiders, but snakes terrify me. I can’t even look at pictures of them in books (or on your blog!) without getting the heebie-jeebies. I envy your bravery and acceptance of the slithering ones. Have you ever had one come into the house? My aunt used to have black milk snakes come in through her heating vents. I would die!! I used to really not like them either. Then I started reading Tony Hillerman books, mysteries set in the Navajo Nation, and he talked about how Navajo see the snakes as blessings, because they eat the mice that would otherwise eat their corn. And I realized a lot of my dislike was just cultural, just from the Bible story in Genesis. Also, snakes have really poor vision and are basically deaf. They can’t detect us coming around very well. Think about your reaction if a huge giant appeared out of nowhere in your backyard, you would wiggle and thrash too! Learning that has made me a lot more sympathetic toward them. That being said, I know some people have a hard time with them so that is why I chose the picture of the coral snake colors for the featured image, instead of showing any snake heads. Sea creeps? Whatever they are, I am sure I would hate them in solidarity with you. Oh, I am not a water girl either, or an underground girl. God put me on the surface of the earth and there I will stay. My heritage is Dutch, and I think that my ancestors spent centuries trying to hold the water back out of the land, and I inherited those genes! But I don’t have anything against sharks, eels, and ugly fish –as long as I don’t have to get down in the water to see them. Yepper, I’ve had those diamond-back water snakes here in Salado; even had one chase me out of the creek! Then had a couple come and have dinner on my fish in my pond, so I put them in a big bucket and down to the creek they went. Okay, it took two of us to put one small copperhead in an igloo cooler, close the lid, and carry it off to release it far from the house — and you’re catching and putting multiple snakes in a bucket?! What a woman! What great observations! The colouration of the coral snake is very striking.